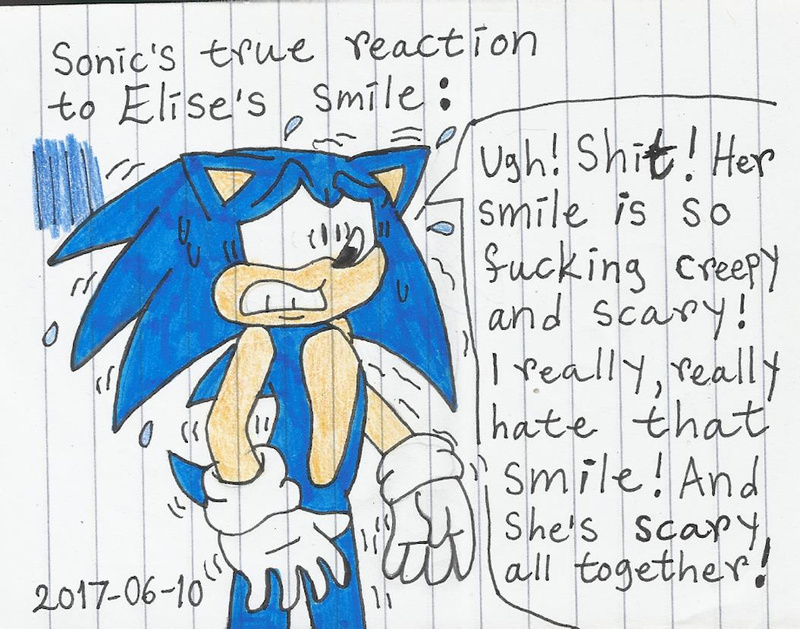 When I heard that in Sonic 06 game He told Elise that her smile is cute and loves to see her that. That really creeps me out and bothers me alot as much as Amy called Elise beautiful and cute. Talk about repulsive. I wanted to draw Sonic's true reaction and thought of her smile and all together. You know what Sonic 06 version of Sonic really reminds me of Archie version of Sonic because they're both shallow and uncaring assholes. This is why I think both versions of Sonic himself are similar to each other. Elise doesn't deserve any credits she never did anything, yet Sonic gave all of it to her and didn't give his known friends any Gratitude at all after everything they do for him and support him. Talk about shallow. Elise isn't so cute at all. she really is scary. While all the characters we know and love think she's the most beautiful, sweetest and innocent princess ever but all I see her as the most evil, scariest, spoiled and rotten Sonic game character ever. She's a total mary sue and spotlight thief. Mary Sues are annoying, scary, evil and spoiled. They get away with everything. I wish Sonic's reaction to her would be the same as mine.